With a little help from blind luck, the late Maurice Sendak, who died in 2012, will have a new book out next year. Sendak wrote and illustrated "Where The Wild Things Are," "In The Night Kitchen." He illustrated the "Little Bear" series and many other children's books. And the one that will be published next year is called "Presto And Zesto In Limbo Land." Sendak did the illustrations and wrote the manuscript with his collaborator, Arthur Yorinks, more than 20 years ago. It's a testament to their decades of friendship. And Arthur Yorinks joins us now. Welcome to the program. ARTHUR YORINKS: Thank you very much, glad to be here. SIEGEL: First the story of writing this book - I gather you wrote it over 20 years ago, and Sendak put it in a drawer and never tried to publish it. Why? YORINKS: Well, the pictures were actually done in 1990, and they were done to illustrate some disparate nonsense rhymes that were accompanied by a musical suite composed by the Czech composer Janacek. And the concert was in - by the London Symphony Orchestra. And so these pictures were projected as the concert went on. And then they were put in a drawer. And then several years later, we decided one day to put all the pictures on his drawing table. And we began to kind of - like two old jazz musicians, kind to riff on various stories. And lo and behold, it started as a bit of a lark, but it ended up being a complete narrative. SIEGEL: Why didn't it get published then? YORINKS: You know, it was the kind of thing where he was so wrapped up in other projects that, you know, it was finished creatively in terms of our work. It would then need to go to an editor and, you know, start the whole process. SIEGEL: I think you've gotten to the numb of this. You were deterred from publication because of what editors would do to your project. YORINKS: (Laughter) No, not quite. But it's a long process even from sort of finished pictures and manuscript to having a book in the stores. And because there were other things on the plate both for Maurice and me individually, we always thought we would get back to it. But we unfortunately didn't. SIEGEL: How did it come to be published now? YORINKS: It was found by Lynn Caponera, the head of the Maurice Sendak Foundation in a file folder and gloriously sent to our - Maurice and my mutual editor. And it was totally complete when it was found. So we didn't really have to do much. SIEGEL: So who are Presto and Zesto? YORINKS: Well, they're actually us, Maurice and myself (laughter). The main drift of the story was a kind of homage to a longstanding friendship. And so in a rather anecdotal way, Maurice had given me the nickname Presto. I didn't want to let him get away with giving me a nickname by myself. So I named him Zesto. And so we used those names for the characters in the book because the book is about friendship and about surviving in a very, very mixed-up world. And so we indulge ourselves in calling the characters ourselves. SIEGEL: ...If the writer didn't want to see it published during his lifetime, maybe it was because he didn't want it to see the light of day. I mean is it - do we have the right to go publishing things? In this case, of course you're also an artist here. SIEGEL: You're alive, and it's your decision to make. YORINKS: ...I think, last I checked. 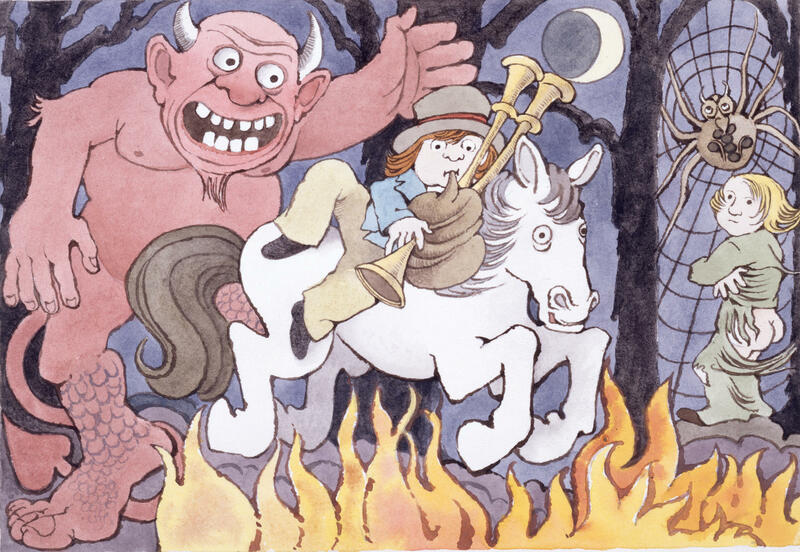 SIEGEL: Did Sendak have any ambivalence about this project? YORINKS: No, he didn't. And you know, the nice thing about it is sort of, as the old saying goes, I was there. And Maurice would have been totally, totally delighted to have us out. We fully intended to do something with this book and publish it at some point in time. And we both thought the book was hilarious and fun and full of life. And if he was around, he would be jumping for joy that it's being published. SIEGEL: Are there special plans for publication next fall? YORINKS: You mean, like, a bar mitzvah or something? SIEGEL: I think it's too old for that, actually. YORINKS: It is too old for that, yeah. I don't know exactly what the plans are other than putting it out there. But it's a wonderful epilogue to our friendship to have this book come out. And it's certainly a terrific addition to Maurice's enormous and glorious canon of work. SIEGEL: OK. Arthur Yorinks, co-author of "Presto And Zesto In Limbo Land," illustrated by the late Maurice Sendak. The children's book hits book shelves next fall. Thanks for talking with us about it today. YORINKS: Thank you so much.